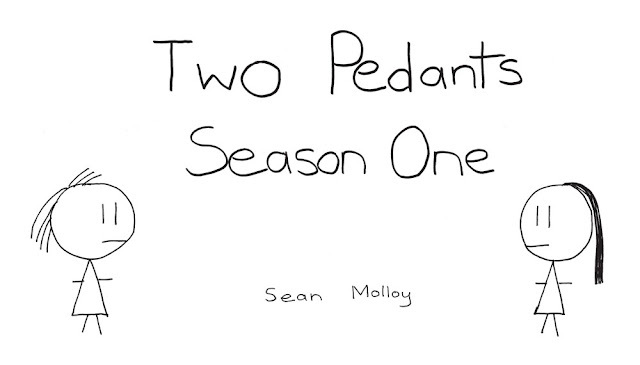 Two Pedants Season One collects all the strips from the first season of this much-loved web comic about two pedants saving the world one correction at a time. It also contains character profiles, deleted strips, and a special preview of Season Two. Two Pedants features two self-styled 'linguistic superheroes', Blonde-haired Pedant and Black-haired Pedant, along with their sidekick 'Curly-haired Guy', who, in a somewhat meta twist, also draws the comic. Other characters who pop in include their ever-cheerful nemesis TXT SPK GRRL:), a time-travelling Shakespeare (who is copying down his own plays to avoid having to write them), the supercomputer Deep Blue, Frankenstein's Monster (or Adam, as he'd rather be called), and various kinds of punctuation. Good fun for grammarians and those corrected by them. order it through your local bookshop. If you are the local bookshop and wanted to order the book, we offer trade prices and sale-or-return or consignment terms. Email the distributor, Seraph Press, on seraphpress@paradise.net.nz. Should the pedants be called pedants? Are the pedants different from each other?